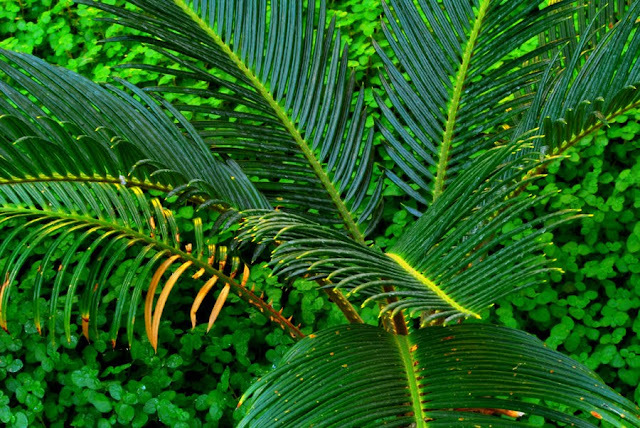 I love the deep green colors here with the palm leaves against the clover groundcover behind it. This was shot in deep shade, so I got a wonderful soft light. I love how much depth of field I was able to get on this shot. ISO 100 f 32 esposure 3 seconds, tripod mounted, sigma 28-80 macro lens. In photoshop I punched up saturation, contrast, adjusted hue, and brightness. Posted In: botany, fern, forest, green, nature, outdoors, palm, photographer, photography, plants, rain.